One of the most beloved and popular marine fish, the Ocellaris Clownfish, goes by many names. 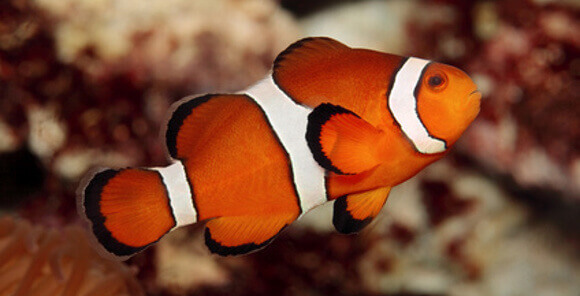 The scientific name is Amphiprion ocellaris, while more common names include clownfish, anemonefish, clown anemonefish, false clownfish, false percula clownfish, false perc, common clownfish and Nemo fish (thanks to the Disney Pixar film Finding Nemo). The Ocellaris Clownfish is easily one of the most recognizable fish in the saltwater aquarium industry and are commonly available at marine retail outlets. They are very hardy, colorful, easy to care for and have a lot of personality in the saltwater tank. The most common variety of Ocellaris Clownfish is mainly an orange fish with three bold white stripes, the center stripe generally bulging toward the head of the fish. The white stripes are outlined by black stripes, generally thin in the Ocellaris (thicker in the Amphiprion percula or True Percula Clownfish). It is a common error that a False Percula Clownfish is simply a tank raised clownfish. A. percula and A. ocellaris are indeed two distinct fish, although closely related. A. percula, or the True Percula Clownfish, is often more vibrantly colored with larger black lines surrounding the white stripes. A. ocellaris is often not as brightly colored (although this is subjective and not a true test) and usually has thinner black outlines surrounding the white stripes. Also, the True Percula has 10 dorsal fin spines (the fin on top) while the False Percula has 11. However, both Percula and Ocellaris Clownfish can be found in the wild or tank bred. Find out more about the difference between Ocellaris and Percula Clownfish. Ocellaris are well known for their up and down swimming motion as well as their propensity to host anemones, hence the common name anemonefish. In the wild they usually only host the Magnificent Anemone (Heteractis magnifica) and the Giant Carpet Anemone (Stichodactyla gigantea). In captivity, they will often accept surrogate hosts, such as corals, other anemones like the Bubble Tip Anemones, and even rocks, algae, water pumps, a corner of the fish tank or nothing at all. More on getting your clownfish to accept an anemone host. Although everyone knows what the standard clownfish looks like, there are many other varieties of A. ocellaris, the next most common being a Black Ocellaris Clownfish. This fish still has the white stripes but generally very little orange (often some orange in the face), if any at all. There are also mis-barred clownfish, clownfish with very wide bars, all white clownfish and those with no bars at all. Breeders will often specifically breed these different types of clownfish (often called designer clownfish or premium clownfish) because they can be quite attractive and are also relatively rare. In general these unusual patterns and colors do not affect the life or health of the fish in any way and most occur in the wild, just not very often. Some of the most common questions people ask are about breeding clownfish. Well, we’ve written our guide to breeding clownfish, which has information on pairing, bonding and breeding your clownfish. Wondering whether you have a male or female clownfish? It’s a common question and figuring it out can be fairly simple, although it is often misunderstood. 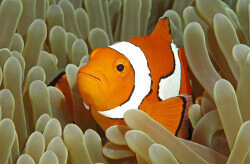 All Ocellaris Clownfish are born neither male nor female and are generally just called juveniles. The most dominant fish in the group will become female and the next most dominant will become male. The female is larger than the male and is more aggressive. It will seem as though she is bullying the male in many cases and in extreme situations she will in fact kill a male that she does not find suitable. They are one of the few marine fish that are fairly easy to breed and raise the young. Adult Ocellaris will pair up and form a bonded pair. Once they begin breeding they are called a mated pair and will continue to spawn regularly for as long as they are alive and well maintained. They will lay up to 2000 eggs each time they spawn, which they will guard and care for until they hatch about 7 to 10 days later. The fry will not survive unless reared by the breeder. They require special food and care from the time they are born until metamorphosis occurs and they become juvenile clownfish nearly two weeks later. Read all about my breeding project in my clownfish breeding blog. The Ocellaris Clownfish is a great choice for nearly any hobbyist’s fish tank. They do well in fish only tanks, full reef tanks, with or without anemones, large tanks and even small tanks. As with any marine environment it is vitally important to maintain the water properly. This includes changing the water regularly and otherwise keeping it clean and free of ammonia and other harmful chemicals. With proper care, the Ocellaris Clownfish can be a valued member of your tank (and your family) for the next ten years or more.